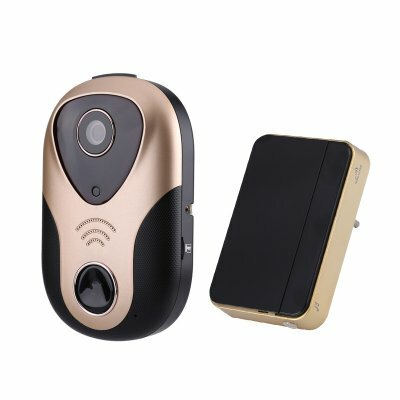 Successfully Added Wireless Video Doorbell - 720p Resolution, Two Way Audio, Night Vision, Mobile Support, Motion Detection, Alarm Features to your Shopping Cart. With this wireless doorbell, you’ll make sure that never again an unwanted visitor enters your property. Thanks to its easy to install design, this intercom doorbell can be attached effortlessly without any hassle and immensely increases your home security while in place. Featuring 6 Infra Red LEDs, this video doorbell even provides you with clear and recognizable images of your visitors after dark. No matter the time of the day, from now on you’ll always be able to check on who’s trying to enter your home or office. Equipped with a 1MP CMOS sensor, this wireless doorbell is capable of producing high-quality images at any time. With its 720p video resolution, you can be assured that you’ll always be treated with high-end and detailed footage. Additionally, this smart doorbell can be accessed via your smartphone, tablet, or PC – allowing you to see who’s in front of your door and to watch back recordings from afar. Thanks to its motion detection and alarm features, this wireless doorbell allows you to set multiple alarm features. Whenever the sensor is triggered, your intercom is capable of sounding an alarm or to send you a notification on your smartphone or through email. Thanks to this, you’ll always stay up to date about the latest security status of your property no matter where you’re located. Additionally, it comes with two way communication – allowing you to communicate with whoever is located in front of your door without you needing to be physically there.